THINK fountain pen in the lovely "Giraffe" pattern, a Christmas 2013 gift from my parents' wire fox terrier, Chandler, thus the small dog figurine. Update: Sadly, Chandler passed away on January 5, 2014 at the age of 14, but this wonderful fountain pen will always be a reminder of him. He was a great little dog. 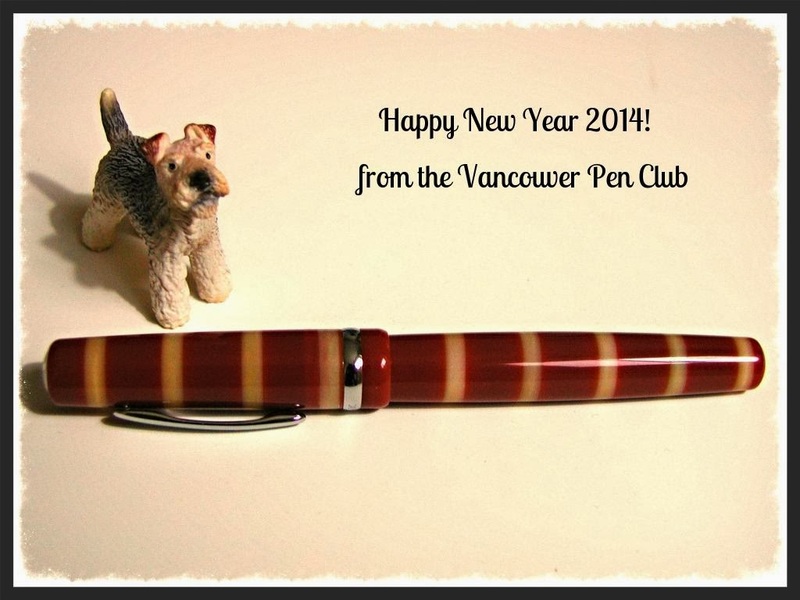 Hope to see you at our next meeting, which will be on Thursday January 16, 2014 at the usual place (Perks pen store, 5844 Cambie Street, Vancouver, BC) from 6:30pm-8:30pm ("early birds" welcome at 6:00pm, to chat before the meeting). Our theme will be "Sumgai Finds! "(pens acquired at incredibly low prices--e.g. garage sale finds, great deals, etc )and, as usual, "Newest Acquisitions" will be our secondary topic..... No RSVPs required!